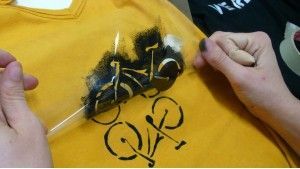 L’Armari Col·lectiu (The collective wardrobe), using a textile printing workshop to convey the message, will attempt to encourage the use of the bicycle as a means of transport. An artistic production space to raise awareness of, and to promote, the benefits of cycling. Graphics, words or slogans on the theme of cycling, will be used for printing upon clothing, and spreading the message of adopting a responsible attitude towards the environment. Textile advertising strategies which, after the workshop has ended, will turn into free-range publicity, roaming throughout the entire city. A counter-advertising gesture! Places will be reserved according to order of registration. Payment will be in cash on the day of the workshop. Each participating family must bring clothing to be printed, for example, T-shirts, handbags, trousers, dresses, etc..